As the variety of titles and posters indicates, director Jean Delannoy's 1956 movie was intended for an international audience. One version was made in French, the other in English. This movie is now little-known, partly because of the confusing variety of titles. 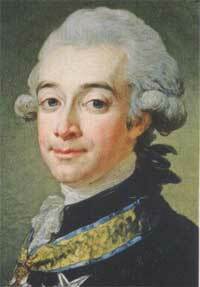 Its main emphasis is on the Queen's alleged affair with Swedish aristocrat Axel von Fersen, and also the latter part of the Queen's life, including the flight to Varennes, and consequent imprisonment and execution.For movie buffs, the film is also of interest because its director was famously the target of vicious criticism by the New Wave directors emerging in the 1950s. 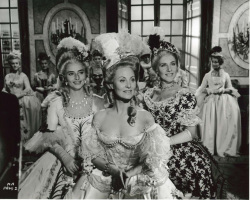 Michele Morgan's Marie Antoinette is a litle lacking in warmth, but she conveys an aura of royal elegance and style. 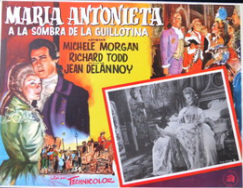 This mid-1950s movie goes under several titles, although released in the UK as Shadow of the Guillotine. This is because it is an example of an important postwar trend in the cinema world: the internationalization of movie production.For financial / taxation reasons, as well as convenience of production, movies were increasingly the product of multi-national deals, using actors, writers,directors, studios and locations from several countries. Many of these movies were spectaculars, taking advantage of the variety of great locations and a cheap supply of extras in low-wage countries. 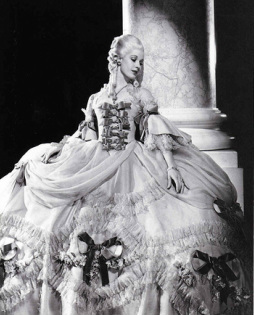 Marie-Antoinette / Shadow of the Guillotine offered a recognisable and fascinating personality, a famous series of events and the backdrop of Versailles. But such productions were condemned by both traditionalists and the New Wave for what they regarded as their extravagance and lack of specific national identity and generic subject-matter. All of these features, both schools maintained, came at the expense of film-making that focused on social, political and personal issues. 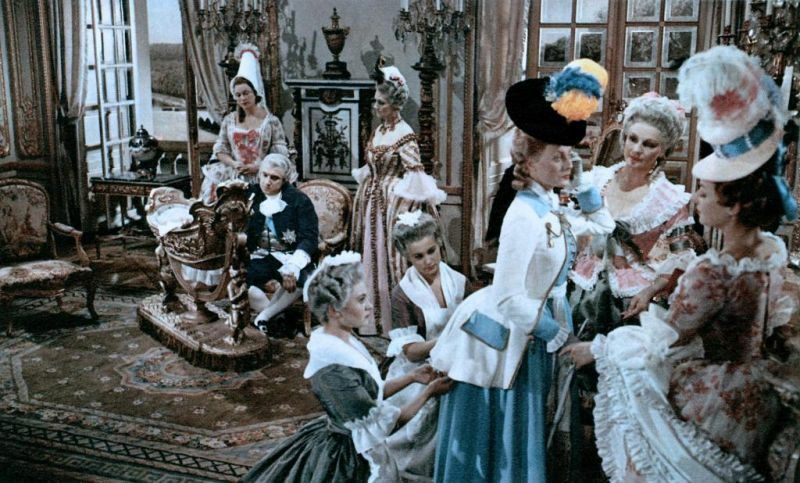 Sofia Coppola's 2006 movie follows its half-century older predecessor with its emphasis on the glamour and conspicuous consumption of the Versailles court. Her movie also follows the 1956 version in that it spends some time on the relationship between Fersen and the Queen, although Coppola's is considerably more explicit but rather less convincing, despite Todd's wooden performance as Fersen. 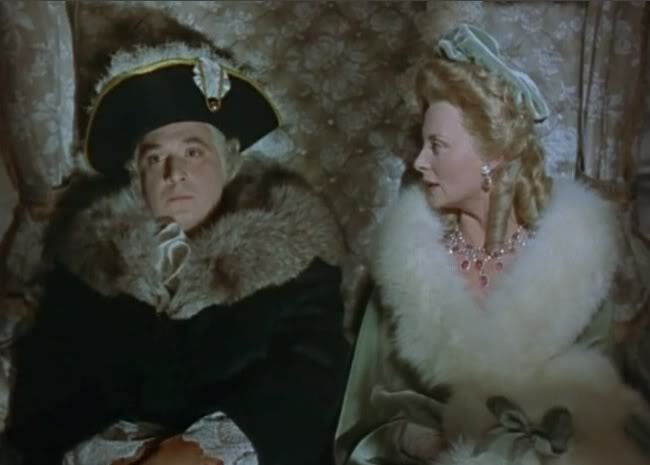 Richard Todd as a rather wooden von Fersen. 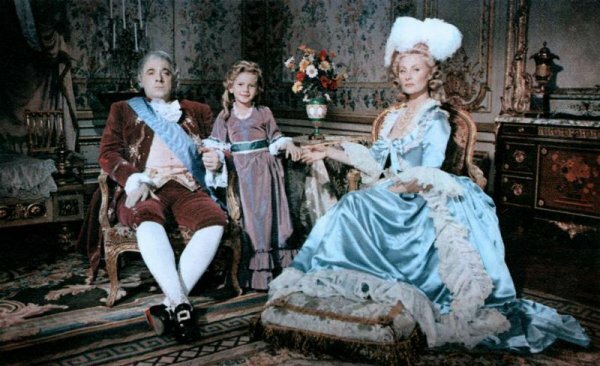 The royal family -or three of them - in Duhommel's movie. King and Queen as the net draws in. Coppola's view of the Fersen affair is rather over-heated. Portrait of Count Axel von Fersen. 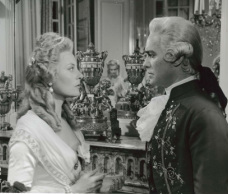 Coppola's 2006 Marie Antoinette follows the 1956 movie in paying considerable attention to the Queen's affair with Count Alex von Versen. However, the 1956 movie is more realistic if less explicit, treating the affair almost as a court ritual and a study in mutual calculation. Delannoy''s movie also pays more attention to the royal children; it treats the King as a rather slow-witted and hidebound monarch, an error not made by Coppola. Marie-Antoinette's director (who died in 2008, aged 100) was a controversial figure in French cinematic circles when he made the movie in 1956. Delannoy had worked in the French film industry since the 1920s, first as an editor, and then moving on to direct in the 1930s. In the 1940s several of his movies were well received, including Les Jeux Sont Faits -which had a screenplay by Sartre - and La Symphonie Pastorole (1946) which the Palmed'Or at Cannes. But in the early 1950s Delannoy came under sustained attack by a new generation of French movie-makers, especially Francois Truffaut whose famous article "A Certain Tendency" condemned the French commercial cinema and directors such as Delannoy who relied heavily on scripts and prided themselves on their careful, rather traditional, craftsmanship. Truffuat and Godard established the cult of the auteur, the director as presiding genius, relying on improvisation and breaking the rules of plot and structure, using unknowns for actors, while disdaining commercial considerations. 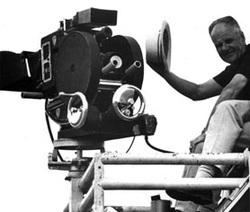 For them film-making was a highly personal statement of personal and political opinion. Dellanoy's studio-bound films, such as Marie-Antoinette and 1957's Hunchback of Notre Dame, expensive featuring stars like Michele Morgan and Anthony Quinn, and internationally financed, were the antithesis of what the new generation considered to be worthwhile cinema.